From Cardinal Seán's blog. Published 1/11/2019. Local. Here in Boston, we have the beautiful custom of ending the old year and beginning the new year in church. So, on New Year's Eve, I went to St. Clement Eucharistic Shrine for the archdiocese's annual New Year's Eve Vigil and Mass for the Solemnity of Mary the Mother of God. We are grateful to the Oblates of the Virgin Mary for their gracious hospitality again this year. The octave day of Christmas has had different themes in the past, but the present liturgical celebration is of Mary the Mother of God and the Church -- in which the Church congratulates Mary on the birth of the Messiah. We are happy that a number of priests, seminarians, and religious were able to join us along with many young adults and people involved in the pro-life movement. Prior to the Mass, which begins at 11:30 p.m., we have a Holy Hour, and the rosary that is part of the Holy Hour always has a pro-life theme. As we begin the new year, it is fitting on the feast of the Motherhood of Mary that we pray for mothers who are experiencing challenging pregnancies. It is always a great event and a wonderful way to end the old year and begin the new year by asking for forgiveness for the sins of our past year and recommitting ourselves to a life of discipleship and embracing the mission. The next morning, as I do each year, I celebrated Mass with the Haitian community in the archdiocese because, in addition to being New Year's Day and the feast of Mary the Mother of God, January 1 is also Haitian Independence Day. We are proud to have the third largest Haitian community in the United States, and we always have a wonderful assembly of Haitian clergy and parishioners along with choirs of various churches join us for the Mass. 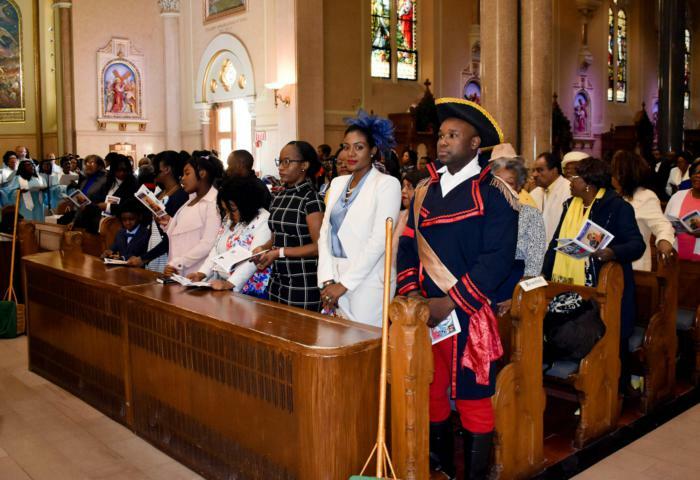 This year, the Mass was held at the Basilica of Our Lady of Perpetual Help (Mission Church), which was very appropriate because Our Lady of Perpetual Help is also the patroness of Haiti. The Mass always ends with the singing of the "Te Deum," a hymn of thanksgiving, which is customarily sung in Latin American and European countries on New Year's Day. Then, immediately after the Mass, there is a rousing rendition of the national anthem of Haiti. That evening, I had three Capuchin friars visit for New Year's dinner: Brother Jim, Brother Diogo, and Brother Francisco. I also gave them a tour of the cathedral, which is coming along nicely. Those who have gone by the cathedral recently may have noticed that the lighting is in place behind the stained glass windows, so the cathedral now looks just resplendent at night. We are all very anxious for the completion of the other renovations and the opening of the cathedral, which will take place before Holy Week. Finally, on Wednesday evening I attended the interfaith prayer service at Morning Star Baptist Church in Boston, held on the eve of the inauguration of Governor Charlie Baker and Lieutenant Governor Karen Polito for their second term. We were pleased to be joined by such a large representation of Jewish, Catholic, Orthodox and Protestant clergy. There were many prayers and readings as well as remarks by Governor Baker and Lieutenant Governor Polito. Governor Baker spoke about the importance of prayer and faith in the life of individuals and in the life of the community and said that, for him, the interfaith prayer service is the most important of his inaugural events. Of course, it was an uplifting celebration and also a wonderful opportunity for the various faith leaders to come together and pray for our civic leaders as we begin this new year.